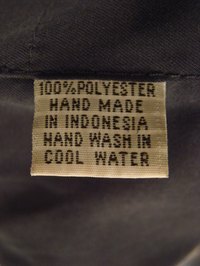 Polyester is a widely used synthetic fabric. Because it's a plastic compound made from petroleum byproducts, polyester melts and may fuse when exposed to excess heat. This makes it possible to produce non-woven fabrics, such as felt. However, both woven and knit polyester fabrics are also available. Due to differences in production methods, there is a wide range of textures and weights in this fabric family. Sewing technique will vary for each. Before sewing with polyester fabric, wash it in cold water and dry it on low to medium heat. This removes any excess coatings or colorant that could interfere with your project. A fresh needle in the smallest size available is most effective with polyester. Worn-out needles have nicks and protrusions that can snag small fibers in the polyester and cause tearing and puckering. Over-sized needles can cause visible holes that are unsightly and weaken the seam. Knit polyester fabrics are especially prone to this problem. Polyester thread matches your fabric in elasticity. If using polyester thread on a sewing machine or serger, wind the bobbin loosely and sew at a slow to moderate pace to prevent the thread from feeding too quickly. The intense friction caused by improper threading can cause polyester thread to stretch. When cooled, this stretched fiber will shrink, and you will be left with irreversible seam bunching. Cut polyester using a with-nap layout. Cut pattern pieces maintaining the same orientation for each piece. Commercial patterns bear a directional arrow that may be used to align patterns. Making pattern pieces using a nap layout requires more fabric than without-nap, so be sure to read the material quantities list carefully when purchasing fabric. Before cutting pattern pieces, iron fold-lines flat with an iron set for synthetic fabric. If creases can't be taken out, remove the affected section of fabric. Cut satin polyester with sharp scissors. You may have to use pattern weights while tracing onto the fabric. Tack your fabric to a few sheets of tissue paper or white computer paper to create a stable, non-slip backing. This backing keeps your fabric from sliding against itself, your hands or the sewing machine platform. Always finish the hem of a satin piece using a narrow-folded or rolled hem to prevent unraveling.